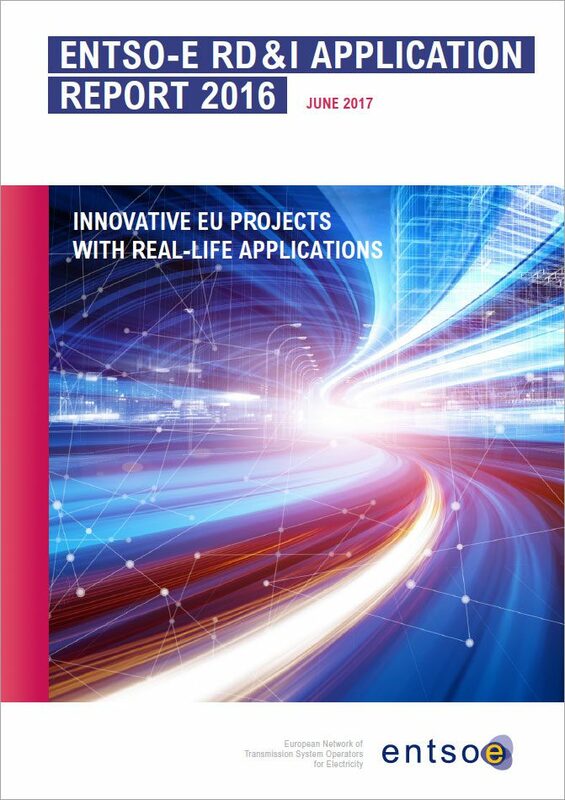 ENTSO-E’s RD&I Application Report 2016 shows concrete examples of results from EU projects which have led to real-life applications. The scope includes projects co-financed by the European Commission (EU projects) in which Transmission System Operators (TSOs) have been participating in recent years. 20 EU projects were considered in the report. A number of these projects were finished several years ago and were also dealt with in the RD&I Application Report 2014. Other projects were completed more recently and in this case, the focus on quick-win applications of intermediate results as the full project outcomes are typically not yet consolidated or ready for deployment. For certain projects, foreseen applications in the very near future were also highlighted. Finally, three projects are still ongoing and have been included in the scope of the report because a number of the approaches developed are already influencing TSOs in terms of their operational practices. ICT and Digitalisation of the Power System: “Big data” management; data-mining tools; development of interfaces with neutral and transparent data access; recommendations for standardisation activities and protocols for communications and data exchanges; “Internet of Things” (IoT); cybersecurity. Limitations of the costs of network modernization while maintaining or increasing the system security and efficiency. Projects crucial to accelerate the coordination of network operations at the European level. Power System Flexibility (Cluster 3) has only been touched by certain projects, especially with regards to network flexibility and improving RES forecasts. A number of projects have also contributed to Power System Economics and Efficiency aspects (Cluster 4) in particular with regards to consumers’ and distributed energy resources’ participation in power markets. Work is still ongoing pertaining to the modelling of various segments of the electricity markets. No RD&I project has been concentrated on ICT and Digitalisation of the Power System issues so far (Cluster 5); however, these aspects have been addressed in a transversal manner through different projects presented under the other clusters. For instance, concepts surrounding the IoT and big data management and data-mining tools have been addressed by projects dealing with grid analytics; protocols for communications and data exchange are being dealt with by projects focusing on consumer involvement in power markets. Requirements for wind generators in ENTSO-E Network Code resulted from network studies carried out within the EWIS project, and were also used as inputs to the Ten-Year Network Development Plan (TYNDP). It has fostered greater integration of wind generation and provided the grounds for harmonisation of network codes across Europe. The MERGE project served as the basis for network impact assessment for ­Electrical ­Vehicle penetration. The REALISEGRID project supplied the framework to create a harmonised pan-European approach to electricity infrastructure evolution. This approach was employed to evaluate several projects out of the TEN-E Guidelines (2006) and “Priority Interconnection Plan” (2007) and is the starting point for the CBA of the e-Highway2050 project. The e-Highway 2050 project delivered a new transmission system long-term scenario and planning tool for the Pan-European Transmission Network (horizon 2020 to 2050). This has granted TSO and academia the opportunity to challenge the local simulations in the context of national strategies, and provided more precise cost-benefit analyses of development options in long-term studies. In parallel, the GRIDTECH project assessed the role of innovative grid technologies in network expansion and delivered a toolbox now available to the TSOs. Practical tools and guidelines for engaging stakeholders in new transmission projects ­delivered by the BEST GRID project allowed TSOs to review their procedures and organisation, thus leading to shorter time to permitting, reduced opposition to projects and ­diminished litigation. On the same note, the stakeholders’ engagement methods ­developed by INSPIRE GRID are providing similar benefits. Thanks to methods and technologies developed within the BEST PATHS project, ­interconnection capacities have been reinforced with limited investment costs. Robots for mounting air-warning markers were also devised to avoid linemen climbing on top of t­owers, therefore increasing safety for workers. The ongoing GARPUR project is creating awareness, both at the TSO and policy maker levels, of the advantages of utilising probabilistic reliability management methods. A higher level of power system stability was achieved owing to the application of a new inter-area oscillation analysis tool produced during the ICOEUR project. This means that the risk of blackouts at the pan-European level is reduced. Significant algorithmic advances in time-domain simulation, nowadays implemented in EUROSTAG software and used in operational studies, are based on the results of the PEGASE project. Specifically, the permit the reduction of limits and uncertainties ­associated with dynamic network equivalents, improving ­ performance, flexibility and accuracy of many simulation tools. The TWENTIES project allowed demonstrating many technologies now broadly ­implemented in Europe, such as dynamic line rating (DLR), overhead line controllers and ­real-time thermal rating, live conductor optical systems, HVDC grids and power-flow control devices, to limit the recourse to re-dispatching. The software tools for global vulnerability analysis and risk assessment of Power ­Systems developed by the AFTER project will allow identifying measures to ­increase system resilience, thus enhancing the standard N-1 approach. The UMBRELLA and iTESLA projects demonstrated the need to use the CGMES data format for data exchange in the areas of system development and system ­operation to allow faster coordination and improved security at the pan-European level. Methods from the EWIS project have led to increasing overhead line transmission ­capacities and the implementation of ­operational remedial actions for operational risk ­assessment, flow control and operational flexibility measures. The ANEMOS.PLUS project developed probabilistic wind forecast tools allowing TSOs to better quantify the need for additional ­reserves ensuing from high ­penetration of wind power. On the same note, the methods developed by the SAFEWIND project has permitted TSOs to make significant progress in understanding wind generation. The market simulation tool developed by the OPTIMATE project as a prototype is being industrialised under the name of PROMETHEUS and will be used to unify several market modelling tools, thus improving the quality of market studies and reducing computation time. The NICE GRID project provided a real-life assessment of the capabilities of distributed energy resources (storage devices, aggregators, RES producers and consumers) to provide flexibility services to the TSOs (ancillary services, tertiary reserve), which represents useful inputs to prepare the market design of the future. The ECOGRID.EU project allowed demonstration of the effectiveness of early and continuous implementation of communication initiatives to involve consumers inelectricity markets. ENTSO-E encourages TSO partners in EU projects to systematically prepare and evaluate the effective exploitation of projects results for real-life applications. For instance, in order to maximise the value added and impact of RD&I projects, the Support Services for Exploitation of Research Results (SSERR) of the European Commission (DG for Research and Innovation) or the support of specialised independent experts might be harnessed in ongoing EU projects. A new framework was created in 2016 for RD&I activities related to energy networks to support the implementation of the SET Plan – the European Technology and Innovation Platform for the Smart Networks for Energy Transition (ETIP SNET). TSOs, of course, have a leading role within this platform together with distribution system operators (DSOs), non-regulated players (generators, storage operators, ICT providers, manufacturers, etc.) and Member States. Within this new framework, a working group, “Innovation Implementation in the Business Environment”, has been created to facilitate further transfer of knowledge and utility of research findings, hence leveraging the approach adopted by TSOs with the present report.